Palitana, a small town at the foot of the Shetrunjai Hill is a religious Jain center located in Bhavnagar district of Gujarat state. The modified present name of Padliptapur, Palitana is a must visit destination for those who would like to see the combination of human enterprise, architectural skills, and religious fervor. Located 50 km South-West of Bhavnagar, Palitana is also the place where millions and millions of Jain sadhu and muni got salvation. The top of the Shetrunjaya (The Shetrunjaya is one of the five sacred hills of the Jains) is covered with about 900 temples, some of which are of pure marble. Dedicated to the Jain Tirthankars, these temple can be accessed by climb up a 3.5 km winding path with 3950 steps. Constructed in the north Indian style of temple architecture and Vastushastra, Palitana temples were built by generations of Jains over a period of 900 years. The earliest temples date from the 11th to12th centuries AD, but Muslim invaders ruined some of this temples during the 14th and 15th centuries. Later Jains obtained religious toleration and rebuilding from the 16th century AD onwards. Climbing a 3.5 km winding path with 3950 steps leads to the Palitana temples which is very difficult than the one at Sravanabelagola in Karnataka. The path comprises three segments and the walk up the stone stairway into the mountain faces takes about an hour and a half. On the way one can rest at mandapams built at every few hundred steps distance. Sling Chairs are available at a bargain. Porters are also available to carry aged people and luggage. Surrounded by tall battlements erected for defence, the Palitana temples stand on pillars which are carved with floral motifs, images of idols and geometrical decorations. It is said that the marble used for making the spires was brought from Rajasthan and then, block-by-block, it was taken uphill and the carvings were done on the site. Most of the temples are named after their founders. The temples are grouped in enclosures (tuks) and each enclosure contains temples, which may be major, or minor depending on the deity enshrined in the sanctum sanctorum. Each major temple is built according to the tenets of medieval temple architecture. The smaller temples are simpler and used white plaster for their chief walls. The smaller temples contains feet images of Chakravarthy Bharat, Lord Neminath's Ganadhar Vardatt, Lord Adinath, Parshwanath, images of Varikhill, Naarad, Ram, Bharat, Shuk Paribrajak, Suri, Jail, Mayali and other gods and goddesses. The mountain is associated with Rishabhdev, the first Tirthankar also known as Adinath. The temple dedicated to him is the most sacred and notable among the Palitana Temples. It is said that Adinath visited the hill several times and the first temple was erected by his son. Inside the temple there is Adishwara's idol made up of marble having crystal eyes. This white coloured holy image is 2.16 mt high. There is a quadrangle designed artistically in front of the temple where Jains seated to have darshan of Tirthankara images placed in 'chapra', which is plated with silver. On the rear portion of the temple is the Ravan Tree where Tirthankar Adinath had practised a long penance under this tree. Opposite to this temple is another shrine where the feet of Adishwara is worshipped. It is a huge foot prints measuring 47 X 25 inches. Chaumukh Temple is another worthy temple to visit in Palitana. 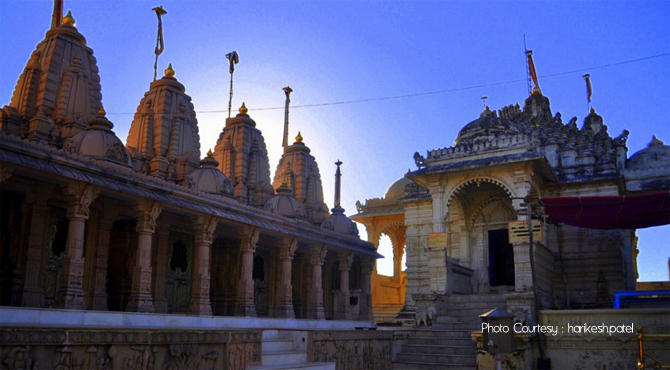 Located on the northern corner, Chaumukh temple houses the quadruple image of Adinath in four directions. The highest among all the Tuks built on the hill, it has beautiful decorated floral patterns.One can see the lofty top of this temple from far away. Inside the enclousure, the temple of Tirthankar Rishabhdev's mother Marudevi is also built. Near to this there are idols of five Pandavas, mother Kunti and Draupadi. The Vallabhai Temple with its finely clustered spries and the large Motisah Temple occupy the middle ground between the ridges. Motishah is the biggest temple built by Seth Motishah. Dedicated to Lord Aadinath, this temple is in itself a cluster of some big and some small temples. Saakarwasahi temple, built Seth Saakarchand Premchand has three idols of four immortal Jineshwaras Rishbhanan, Chandranan, Varishen and Vardhmaan. Other temples worth mention are the Narshi Keshav, Chheparwasahi, Heemwasahi, Premwasahi and Balawasahi . The best time to visit is between November and March. The hills are closed during monsoon for all and pujas tend to be performed around noon. At the foot - hill of Shetrunjaya, there are Aagam Temple, Jamboo Dweep, Sprawling Museum etc which are worth a visit.